Well you know what happens when the weather is good? Yep,I decamp to the garden. It seems ages since I last wrote a blog and to tell you the truth I have very little sewing to show, though I did finish April's socks and have cast on May's, so I am still on track for 12 pairs this year. I have always liked Leanne Beasley patterns and her Magazine Vignette Leanne's House . 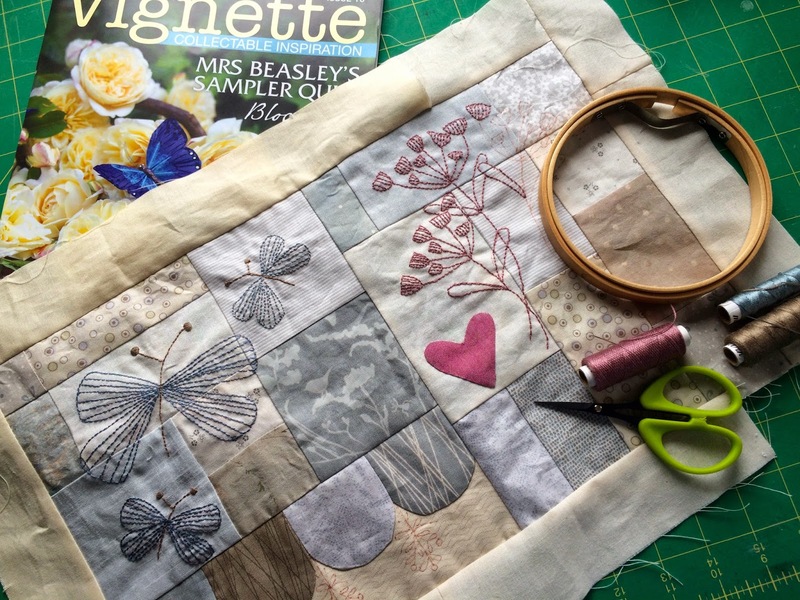 In issue 10 she started a sampler quilt and as it was just 4 x15" blocks I thought that's for me. So I sent to Australia for issue's 10 and 11 and obtained issue 12 from the UK and set about cutting it all out. Goodness me! 21 different fabrics. This should help to bust the stash of fabric I have. This is the top half of the first block. Piecing,embroidery and appliqué, yep needle turned. :0) Some of the embroidery is so close to the edge, I had to add some temporary scrap fabric to be able to use the embroidery ring. I am certainly having fun with this project. You have probably guessed it's raining today so other then water things in the greenhouse, I am house bound. So its back to the sewing room to add the bottom half of this block. Also to sort out this months North Pole Blocks, or I shall be all behind and it will not get finished for Christmas. 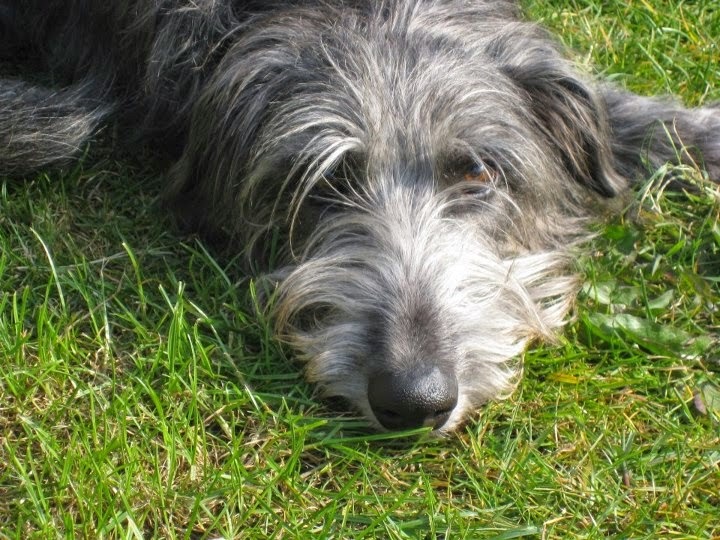 So other than showing you a picture of our beautiful deerhound Gladdie who joins me in the garden on nice days, this is a very short post today. That is what it feels like this week,when it's nice I am in the garden and when it's not I have been trying to catch up with all things sewing. First The North pole Blocks for March are finished. I have been a little slow with them this month. Then the blocks for the Siblings Together for April are finished. These will be traveling to Clackmannanshire to Biff who is the Mama for this month. They will make an interesting quilt. Now these little owls were such fun to make. The pattern is called Hooterville and I am not sure who designed it. It is to be a joint project with all the girls at the Bees for this years Charity Quilt. These two are my contribution, plus I have a Tree to make which is done but not photographed as yet. Don't blink , yes it is Christmas hangings :0). 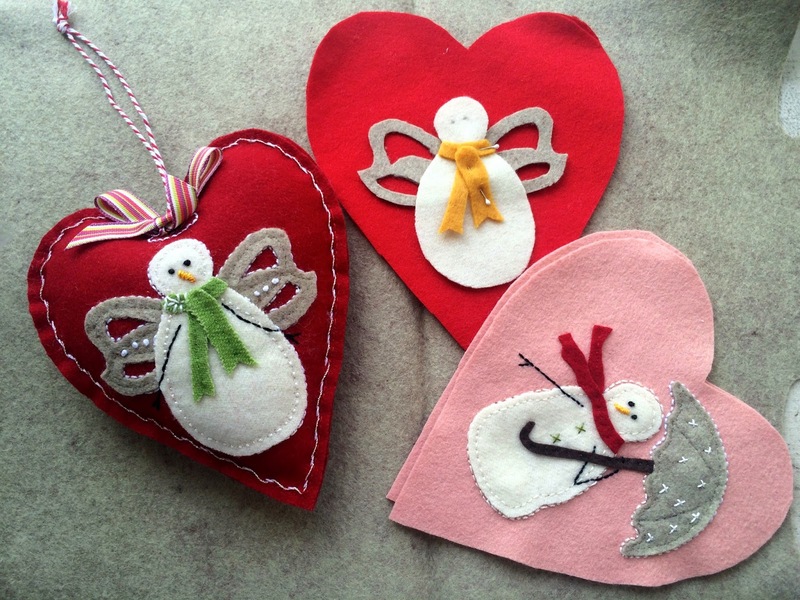 BunnyHill Designs is giving these Snow Happy Hearts as free patterns every month. I am altering them slightly, as you know I always do, adding more embroidery etc. They will be little presents to give away at, dare I mention the word, Christmas!!! Mr and Mrs Mouse ate all my Tomato plants, or should I say decapitated them. So I have had to start all over again, but hey ho I am sure we will still have our own tomatoes again this year.